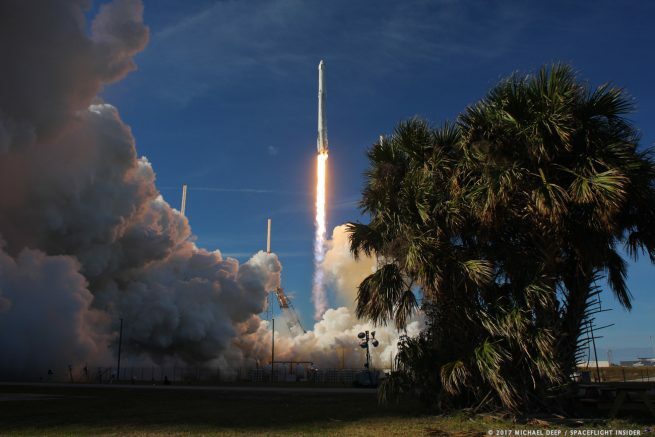 CAPE CANAVERAL AIR FORCE STATION, Fla. – The 13th SpaceX Commercial Resupply Service (CRS-13) mission roared into the Florida sky aboard a ‘Full Thrust’ Falcon 9 launch vehicle Friday morning. The flight-proven spacecraft and Falcon 9 first stage launched at 10:35 a.m. (15:35 GMT) from Cape Canaveral Air Force Station’s Launch Complex 40. CRS-13 is the 17th SpaceX launch in 2017 and saw an estimated 4,800 pounds (2,177 kg) of crew supplies, experiments and supplies sent to the International Space Station (ISS). It marks the second time a flight-proven Dragon spacecraft has been launched towards the space station. This Dragon last flew on the CRS-6 flight to the ISS between April and May 2015. 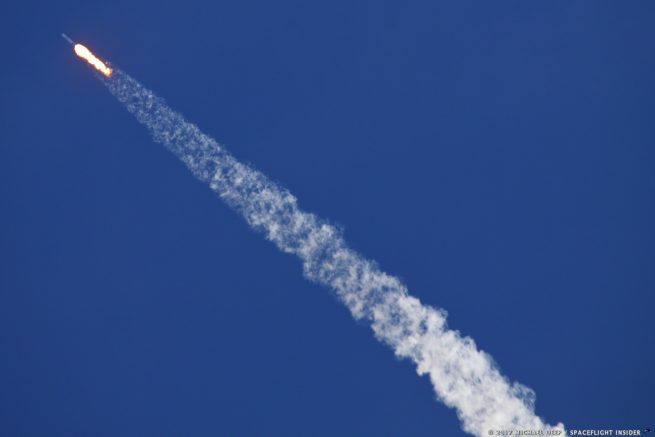 The use of a flight-proven Falcon 9 first stage also marks the first time that multiple flight-proven components have been utilized during a SpaceX launch. 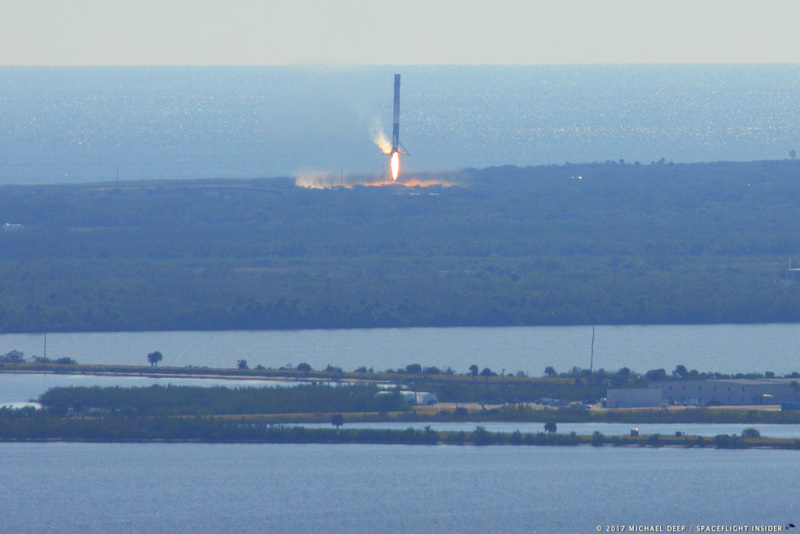 The Falcon 9 first stage last flew on CRS-11 on June 3, 2017 – a six month turn around between the stage’s flights. The weather was partly cloudy for the launch. The 45th Space Wing was predicting a 90 percent chance of favorable conditions prior to liftoff. Both the weather and the launch vehicle’s systems delivered and when the instantaneous (1 second) launch window opened – nothing stood in the way of today’s successful flight. The flight was the first to use the pad since a different Falcon 9 exploded during pre-flight tests in September of 2016. That mission, Amos-6, saw the loss of the Falcon 9 rocket, $185 million Amos 6 spacecraft and a good portion of the infrastructure at Pad 40. There were no issues today however, with the vehicle thundering away from the launch pad and out across the Atlantic Ocean, trimming its trajectory to ultimately reach the ISS. The Falcon 9 first stage pushed through max-Q (maximum dynamic pressure) at just over a minute after launch, followed by main engine cutoff at around 2 minutes, 25 seconds into the flight. As the first stage separated from the second stage, the Merlin Vacuum engine on the second stage ignited to propel the second stage and Dragon spacecraft to orbit. The flight-proven first stage conducted a boostback burn to safely land at Canaveral’s Landing Zone 1 (formerly Space Launch Complex 13). The first stage performed a series of maneuvers over a period of about five minutes to refine its trajectory toward Cape Canaveral Air Force Station’s Landing Zone 1 (formerly known as Space Launch Complex 13) or “LZ-1.” Following the boost-back burn, the stage oriented itself so that its nine Merlin engines were facing the direction of flight. As the vehicle re-entered the atmosphere, four grid-fins were deployed to help steer the 160 foot (50 meter) tall first stage toward the landing zone. About 7 minutes, 43 seconds after lift-off, the first stage made a soft landing at LZ-1. This was the second landing for this first stage and the 20th time overall that SpaceX has landed a Falcon 9 first stage. Eight of those recoveries have been at LZ-1 and 12 have been on Autonomous Spaceport Drone Ships positioned out in either the Atlantic or Pacific Oceans. The second stage and Dragon C108 capsule continued to their initial orbit. After about 9 minutes, 14 seconds of flight time, the single Merlin Vacuum engine was shut down. One minute after that, Dragon separated from the second stage and deployed its twin solar panels about 45 seconds later. Astronaut Mark Vande Hei is serving as the prime Expedition 53 crew member who will capture and berth the Dragon spacecraft to the Harmony Module using the station’s Canadarm2. Should the mission go as planned, CRS-13 will remain berthed to the ISS for about one month before returning to Earth. The spacecraft is expected to splash down in the Pacific Ocean off the coast of Baja California for recovery by SpaceX. Its payload consists of crew supplies, scientific experiments, and spacewalk equipment. The total payload weight also includes nearly 1,422 pounds (645 kg) of unpressurized payloads in the “trunk” of Dragon. Once Dragon has been unloaded by the crew, any equipment and trash needing to be sent back to Earth will be packed into the capsule before it departs the space station. Today’s flight was a long time in the making, with the mission scheduled to launch on Sept. 13, Nov. 1, Dec. 4, 12, 13 and 15, according to SpaceFlight Now. SpaceX plans to conduct one final launch in 2017 from Vandenberg Air Force Base located in California, with the launch of the Iridium Next Flight 4. At 18 total launches, 2017 will be the busiest year on record for the company and has outpaced the launch manifests of other space programs. The first SpaceX launch of 2018 is expected to be for the secretive Zuma mission, launching Florida’s Space Coast on Jan. 4. SpaceX is working towards rolling out the cargo version of the next generation Dragon 2 capsule over the next year. SpaceX has not indicated when the first Dragon 2 cargo capsule will fly to the ISS, but it is planning to test the crew-variant of the spacecraft around April 2018. Until Dragon 2 is ready, SpaceX plans to continue using flight-proven Dragon spacecraft to carry out their CRS missions in the meantime. The next cargo mission, CRS-14, is slated to be launched on March 13, 2018 according to SpaceX officials. CRS-13 is part of the $1.6 billion Commercial Resupply Services contract SpaceX has entered into with NASA to complete 20 missions to the ISS by 2019. Refurbished Rocket with Refurbished Dragon from a Refurbished launch pad. Not a bad day. Except they blew up that pad in the first place and it took a standing pork army to refurbish the first stage and capsule. Funny how the general media loves to point out how SX misses their targeted dates but exactly what are they comparing SX to? SLS-Constellation/Orion, 10 of Billions with nothing to show for it except the corporate welfare jobs congress is interested in. Blue Origin has suborbital test flights and big plans but that is for the 2020. They are just falling further behind SX. The most valuable lessons are usually failure and SX hasn’t been afraid of that. SX is going to be able to undercut anyone else on price in the 2020’s. Which isn’t a good thing long term. SpaceX and Blue Origin are both private companies. At the end of the day they are only answerable to investors or shareholders. By comparison NASA is taxpayer funded – making the American people stakeholders by default. Since NASA has awarded a high-value contract to SpaceX, the “general media” is doing its job asking tough questions of SpaceX managers. I do not want sycophantic Elon fan boy/girl journalists like some of those at KSC (which is evident during pre-launch press conferences on NASA TV). In the early 80s NASA could do no wrong, they got arrogant/sloppy and 7 people died on Challenger. Now? SX can do no wrong and they’re getting ready to send crews to orbit. Whenever anyone questions them? The SX trolls attack. The Cult of Musk slanders anyone with the nerve to point out SX can’t handle constructive criticism. When a crewed Dragon is lost the crew who dies on it will have been killed not just by whatever was wrong with the spacecraft but by those who have intentionally silenced those who asked awkward questions. On that day? We need to drag the cheerleaders into the light and the deaths need to be laid at their feet. If you can’t handle hearing your pet billionaire’s company missed its launch date 7 times, that two of its rockets exploded and that neither the company or the owner are perfect; then you’re in the wrong business and need to sit down and shut up. When you do bad, you need to hear it, acknowledge it, fix it and move on. Having your lackeys, howler monkeys and trolls attack anyone who points out your failings doesn’t make you better; it makes you worse. You think CRS-7 and Amos 6 were bad? Wait until a Dragon kills a crew THEN you’ll find out just what bad is. I don’t begrudge SX’s success, however, I hate their cheerleaders, who have made it hard to question the Musk-ssiah without being smeared/assaulted. @ Al Ready – What ere you on about . SpaceX, is just working/moving forward to meet their objectives and contract agreements. They are one of the best space innovators in over 55 years. All these flights are working/moving forward to being certified for crew flights. Surely after all these flights they can prove their ability and reliability to fly crew to space. Plus NASA expect safety standards to be met and they are not letting SpaceX do what they like. All the space operators have to prove and certify all equipment use for crew and if SpaceX is certified, they meet NASA’s certification and standards. So maybe you should sit back on watch them succeed. As that is all they have done. Adrian, Your reading comprehension leaves much to be desired. Instead of trying to make what I said be about something else, why not address what Hari and I talked about? SX fans try to silence everyone who ask questions. SX fans have attacked a lot of people, people who care about the lives of the crews who’ll fly on Dragon and are concerned that, whenever we raise questions, we’re assaulted. Or, in your case, you try to make us look dumb by attempting to make the conversation be about something else. Go back and read what we wrote before you try and talk down to someone. We weren’t addressing SX’s contracts, we were talking about how the media and SX fans behave. In the early 80s NASA was arrogant, they were condescending and their supporters talked down to anyone who questioned their decisions and that pride caused the Challenger STS-51L disaster. I’m “going on about” the behavior, the arrogance that we’re seeing – is the same many of us saw in the lead up to the Challenger disaster. I am not real fond of muskrats either Al. Much better to concentrate on exposing the NewSpace agenda than arguing with them and calling attention to their rancorous and toxic behavior. You see, they are here to advertise for that company. The more time we waste trading insults with them instead of exposing their scam, they consider it a win. The NewSpace mob is all about their alternate universe where everything good revolves around the cult leader and everything else is bad. Going after their hero is what hurts them. Ahh, the venomless bite of the old guard. SpaceX has done more in the past three years than NASA has done in a decade, and for far less. So what that Elon has fan support? Are you bitter that NASA doesn’t? Or are you another Apolloist trapped in a past where nothing not launched on a Saturn counts? Pity. Alll progress in spaceflight should be encouraged and supported, not just that which adheres to antique philosophies and protocol. These are all excellent points, but the initial point of comparisons is still valid. All rocket systems have had their setbacks, but SpaceX is making some rather significant acheivements. Also, if anyone else has read the book on Elon Musk, he is described as a very, very difficult man to work for. Almost to the point if being a bit of a tyrant. But most geniuses are. I’m a total SpaceX and Musk fanboy, but I don’t have any dellusions of grandeur, and I would never want to work for him. And sadly, there are people making comments like that for no good reason at all. Not sure how my comment offended you so much, but if it makes you feel better, then I’ll accept your critique as a compliment. When SLS launches you will see something. The world giving the U.S. a standing ovation. We will be on our way back to the Moon. The US could hand out free cures for cancer and the world will still not applaud. You’re living in a five decade old fantasy lined with cost plus contracts and misplaced loyalty in a broken system. SpaceX or Blue Origin will have a tiki bar on the moon before SLS ever launches humans. I noticed a small typo in your excellent SpaceX article. In the paragraph that starts with “About 7 minutes, 43 seconds” you wrote that today was the “seventeenth” booster SpaceX landed intact, but then say 8 at LZ-1 and 12 on ships. It is hard to believe, but I think 20 is right. Thanks! We’ve made the correction. Another successful mission. Congrats to SpaceX, NASA and all those involved.